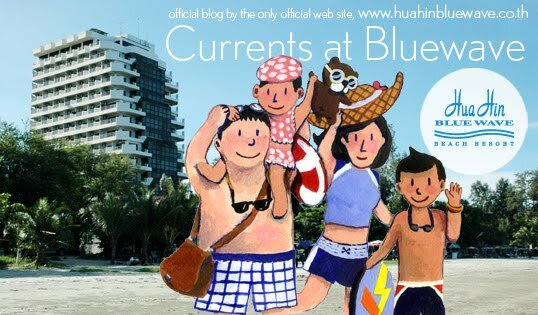 currents at bluewave: mmm. i'm lovin it. writting this blog in english makes me feel like i'm in English class again. My friend, Baris, helping me correcting my English. So forgive me if Baris is busy with his work and I have to writing this myself. 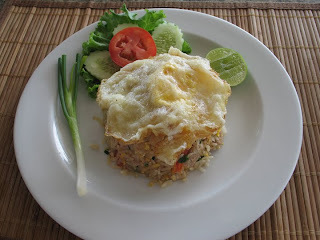 Here is one of my favorite dishes at our Busarakaam restaurant, a pork fried rice, the most simple thai food. However, as simple as it is, the taste is varied in every places i tried. 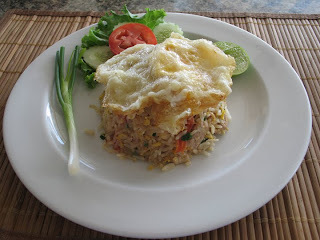 I like our pork fried rice because it tastes like what I had when i was in elementary school. I can still smell the oil and the burned rice when they cooking. The fresh lime adds a favor of freshness. Eating with sea breeze is the addition in every of our dishes. I asked our Manager (khun Surapong) to give me new topping fried eeg because this one couldn't see the egg yolk clearly. I thought it might looks more appetite if the eeg yolk looks yellow and the white looks white. My wife's face faded a bit because this dish is what she ordered, and she expected to eat it after i finish taking this photo shoot. Asking for new topping fried egg might made her wait longer. Our manager went back to the kitchen and came back quickly to tell me that our chef (chef Tum) said this topping fried egg suppose to be like this. It is not the same style as i see in breakfast. It suppose to be crispy at the edge. Our kitchen is fulled with specialties. We are working on how can they presenting it professionally. Although, some should be improved, some should be kept the same.